Thinking about planning a fishing trip or passage this month? With Buoyweather Premium wind, swell height, and swell period charts, you can accurately gauge the wind and swell conditions ahead of time to pick the best weather window prior to departure. The first chart we will look at is the NAM Model Streamline surface wind map. Once you are on your location marine forecast page, this chart can be found in the left navigation menu under "Wind Charts". 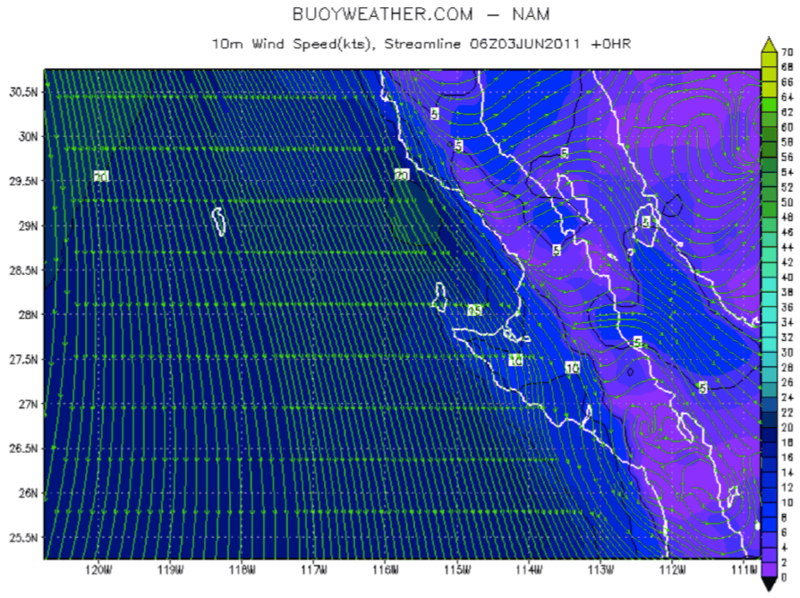 Below shows a strong band of North Wind blowing down the Coast of Baja. 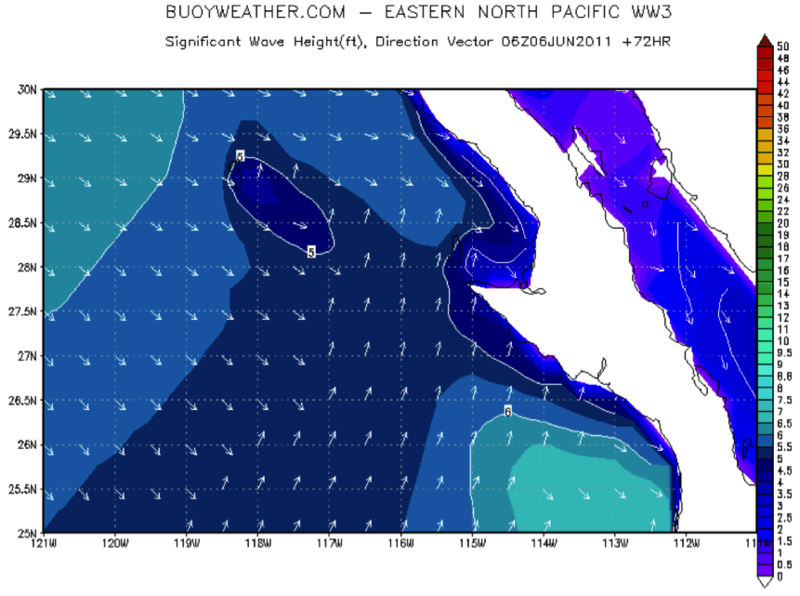 The next chart we will look at is the ENP Model Wave Height chart. Once you are on your location marine forecast page, this chart can be found in the left navigation menu under "Wave Charts". The arrows represent wave direction. We can see that as we approach Cedros Island from the North, the waves will run counter to the wind direction shown in the chart above - making rough conditions for anyone transiting down the coast. The chart below is the ENP Model Wave Period chart. This chart can also be found in the left navigation menu under "Wave Charts". 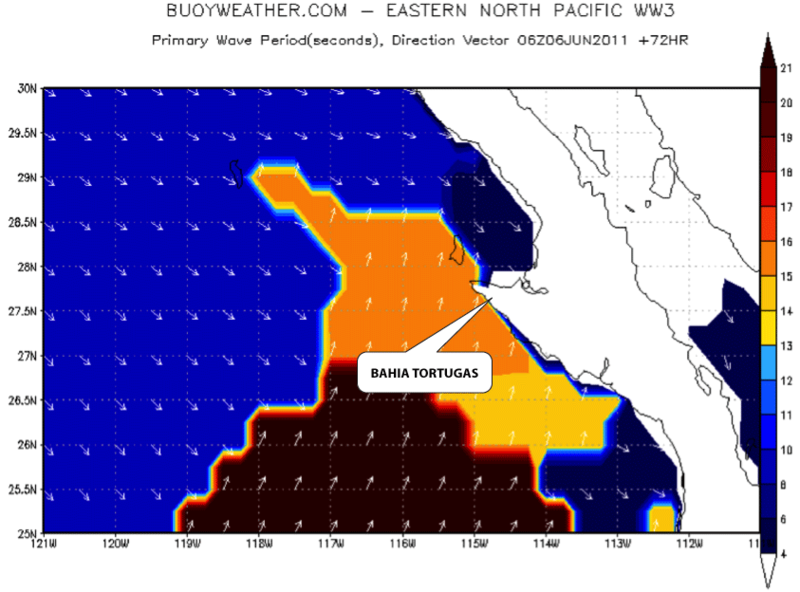 This chart shows wave period for the same area off Baja, Mexico. You can see a large, long period south swell approaching, while in the top of the screen, the short period wind swell is dominant. Buoyweather's wind, swell height, and swell period charts can help you stay safe in all types of situations. To access any of the charts discussed above, go to your location marine forecast using the left navigation menu at the top of this page. Once you are on your location marine forecast page, the chart options will appear to the left.